I'm a big believer in the whole 80/20 rule when it comes to healthy eating - I'm pretty good 80% of the time and the other 20% I eat whatever the heck I like. I certainly don't believe in depriving my body of anything so if I want pizza or a Nandos like I had today, I'll have it. I think depriving yourself will only lead to an unhealthy relationship with food and therefore more binging on the bad stuff. I've recently been making 'pizza' with a tortilla instead of a thick doughy base as it saves a lot of calories! These are so easy to make - you simply spread a tomato sauce (passata with basil is great) or puree onto the tortilla and then add your favourite toppings! I've been adding red onion / tomatoes / peppers and a small amount of mozzarella. When you've added your toppings, pop it in the oven until the cheese is all melted and the tortilla has gone crispy. I then like to add a bit of pesto and spinach or rocket on the top. Perfect healthy lunch! As I said, I've been obsessed with turkey mince at the moment and one of my favourite recipes to make with it is turkey burgers as they're so quick to make and taste like a real treat. I mix the turkey mince with some garlic, chilli powder and a teaspoon of soy sauce then mix it all together and make it into burger shaped patties. You can add lots of different things at this stage - any herbs or spices you like really. I'm going to try adding some lemon and finely chopped spring onions next time. When you've made your burger shapes, pop them on a grill pan or in the grill until they're cooked through - I also like to grill some red onion to add on top too! Then all you need to do is pop them on a bun - I usually go for wholemeal but was naughty and had white in the photo above. I like to finish the burger off with a teeny bit of cheese, sweet chilli sauce and avocado but you can add anything you like - just make sure its not too unhealthy! Another meal I've been making with turkey mince recently is stuffed turkey peppers and this recipe is inspired by Joe from @thebodycoach on Instagram. He makes 'lean in 15' videos showing his favourite healthy recipes and is often making these so I thought I'd give them a go. Like the burgers, they're really simple and are ready in around 20 minutes. All you need to do is cut your peppers down the centre and remove the seeds then pop them in the oven with a touch of oil (I use the fry light as its only 1 cal per spray) and wait for them to soften. This should take around twenty minutes. In the meantime, use your spray oil again and cook the turkey mince with some garlic, onion, a tablespoon of tomato puree, a 500ml carton of pasatta and three teaspoons of soy sauce. This makes a gorgeous bolognese type sauce! You then take the peppers out of the oven, fill them with the turkey mince and pop a small amount of cheese of top. They then go back in the oven until the cheese is melted and that's it, a yummy carb free meal. However, I tend to have a few sweet potato wedges with mine as they're sooo good! Finally we have another super easy recipe and this time its with my favourite seafood, prawns. I'm absolutely obsessed with prawns and always order them when I'm eating out - they're just so yummy! For these ones, all you need to do is marinate king prawns with some garlic, chilli, lime juice and coriander (again, add whatever else you like at this stage). I usually try to leave them marinating for at least an hour to let the flavours infuse (wow, I sound like such a foodie!) and then pop them in a hot wok until they turn pink. I like to serve them on a bed of rocket with sweet potato wedges and avocado but they're also lovely with some brown rice or rice noodles. Yum, yum and more yum! I hope this has given you some inspiration guys - do let me know if you try any of these recipes as I'd love to hear what you think of them. You can tweet me @k_leexjx! As I said, they're all really easy to make and really quick too so great if you're like me and want something quick after a long day at work. Healthy eating really doesn't need to be difficult or expensive like people think! What's your favourite healthy recipes? Would you like to see more of these posts? I love making healthy meals (even if I love pigging out too), and I love the sound of homemade pizza so might just have to try that out. That looks so tasty ! These look so yummy! I especially like the look of the pizzas and prawns. I might have to try some of these out. You had me at 'quick' and 'simple'! Haha. I have been searching for cheap and healthy recipes lately; but have struggled to find many that are different and exciting, and flexible to play around with each time you make them. I'm such a foodie and these look absolutely amazing!! I'm going to have to give them a try oh my gosh! the homemade pizza looks so good! These all look delicious! I definitely need to try the pizza they are my a weakness! I want to eat the page! The stuffed peppers look bomb!! I also never thought of using tortilla as a pizza crust. Genius! I usually do a cauliflower crust, but that can be so time consuming!!! Loved the post. These look so delicious! I've been seeing you post photos of them onto Instagram and I always have food envy! The stuffed peppers are going on my menu for this week - they look delicious! All these look lovely and I need to try them as I need new stuff to munch on instead of being unhealthy all the time. Hmm everything looks so yummy!! 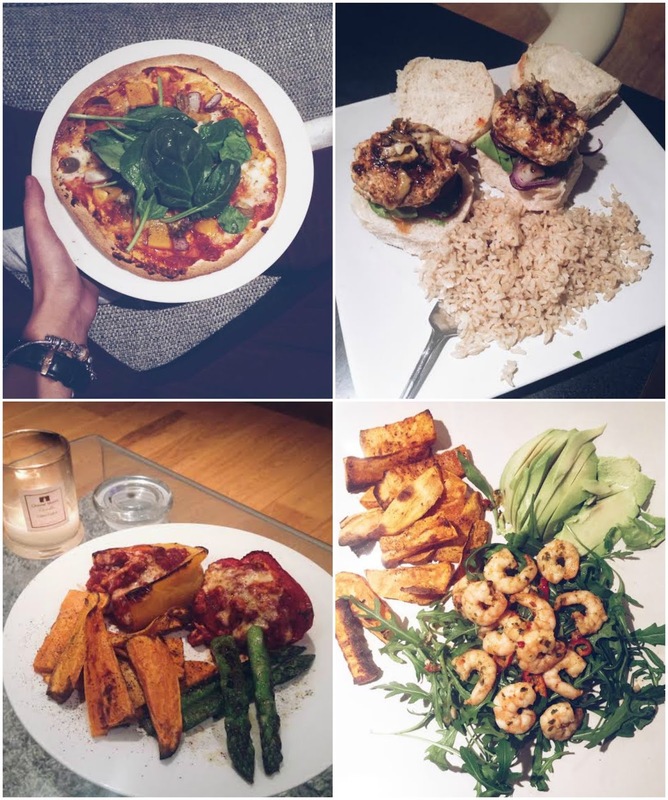 Fab post, it's so hard to think up new meal ideas and I really should start eating more healthy. It looks so delicious! I want to eat more healthy and those dishes looks so yummy - need to try it! The home made pizza looks amazing!! I have only just discovered I like prawns, and I'm not obsessed. Think I need to push the boat and throw some chilli into the mix now! All these recipes look delicious! It's great to have some go-to recipes that are quick and easy to make. I'll definitely be giving these a go, especially the Stuffed Turkey Peppers, they look delicious!